Place an oven rack at the lowest position and preheat oven to 250 degrees. Thoroughly dry the beef, then season with salt and pepper. Heat canola oil in a large Dutch oven over medium-high until almost smoking. Brown the beef on all sides – about 10 minutes total. Remove the beef to a platter. Add more oil if necessary. Add onions and garlic, then cover pot. Cook for about 5 minutes. Remove the lid and continue cooking the onions until dry and well browned – another 10 minutes or so. Add the sherry. Stir, using your wooden spoon to get all of the fond off the bottom of the pot. Cook until the liquid has almost fully evaporated – about a minute. Remove the pot from the heat. Nestle the beef in the onions. Pour any juices from the beef into the pot. Cover with foil, press down to seal, then add the lid. 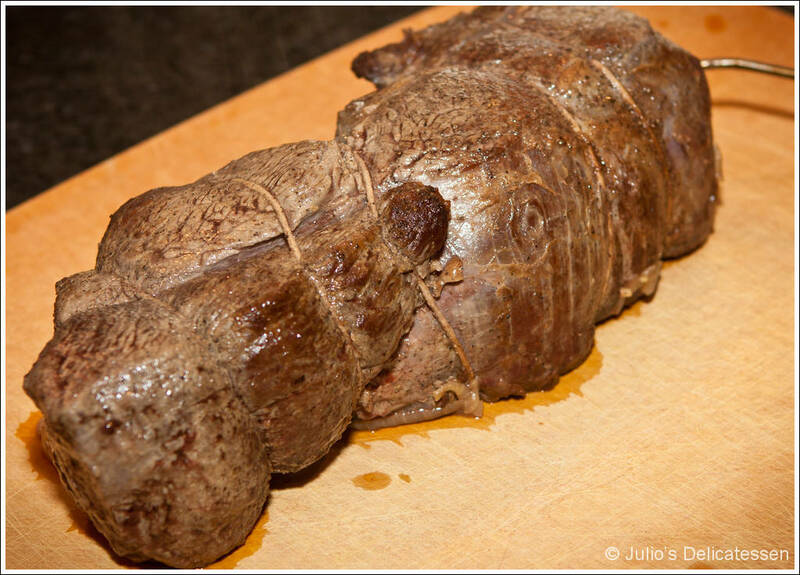 Transfer to the 250-degree oven and cook until the center of the roast is 122 – 125 degrees – 20 or 30 minutes. Remove pot from the oven. 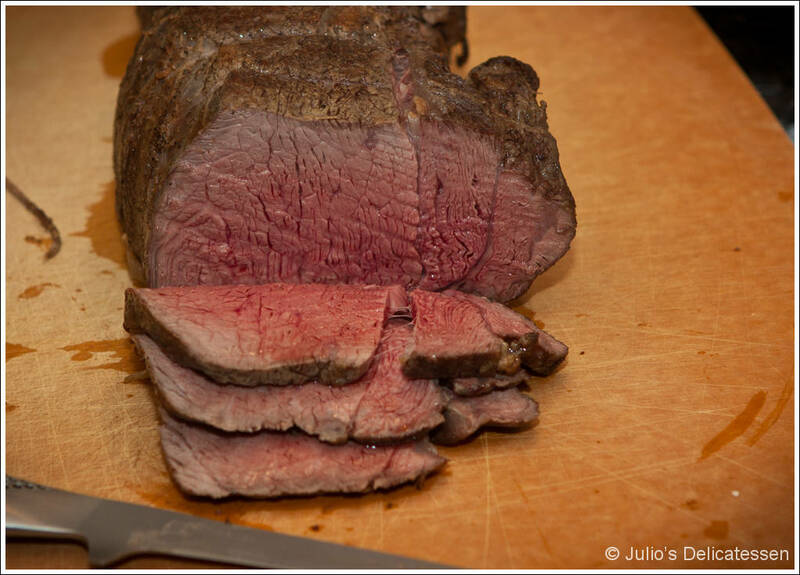 Transfer the beef to a platter or cutting board and tent with foil. Allow to rest at least 20 minutes. Place the pot on a burner set to medium-high. Add the chicken broth and stir to mix thoroughly. Simmer until slightly thickened – 2 – 4 minutes. Turn off the heat, add butter, adjust seasoning, and cover to keep warm. When ready to serve (after the meat has rested at least 20 minutes), remove the twine and slice into 1/4-inch thick slices. 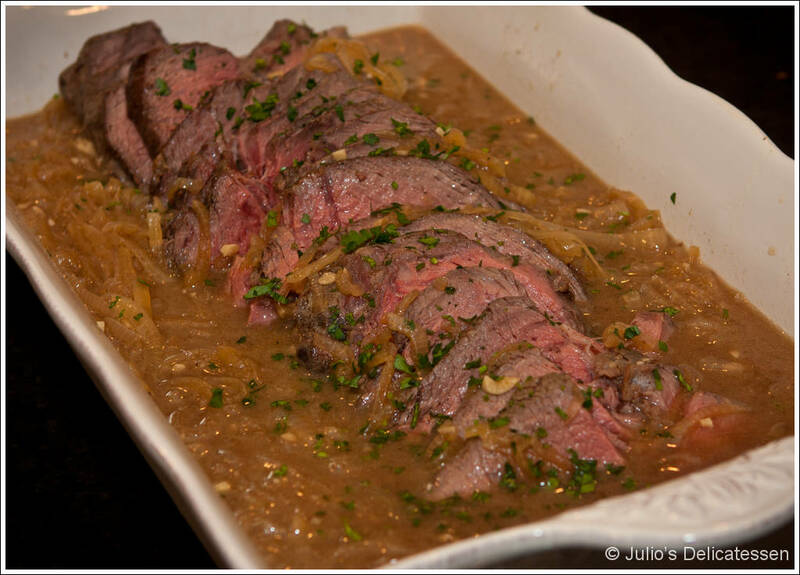 Place on a serving platter and spoon the sauce and onions over the meat.